We’ve all heard of co-working, but how about co-living? As the sharing economy continues to grow, sharing space with strangers is becoming an acceptable choice for city dwellers, and developers are taking notice and swiftly adapting. Today, young adults — particularly millennials seeking flexible, cost-effective living with a sense of community — are gravitating toward co-living developments in major markets across the country. Sound familiar? While this concept has striking similarities to college dorms, the idea is a bit more complex and doesn’t require an outstanding GPA. We see the rise of co-living across the country as a positive sign for the multifamily market overall. The concept of co-living means different things to different people, depending on whom you ask, and it comes in many forms. Generally, it means residing in a multi-unit property that houses young, like-minded adults interested in communal settings and hassle-free leases. Additionally, co-living properties are typically renovated rather than new, but more and more new residential complexes are being constructed to specifically address the rise and popularity of these dwellings. The concept of sharing — sharing space and sharing community — is at the heart of co-living. And, when it comes to co-living amenities, they’re equally important. Some of the most common shared amenities in these ever-more-popular flexible living arrangements often include shared kitchens outfitted with high-end appliances, dishware and other cooking essentials; shared laundry facilities, and shared open offices. Common areas often come perpetually stocked with all household supplies needed, from coffee to paper towels and more. 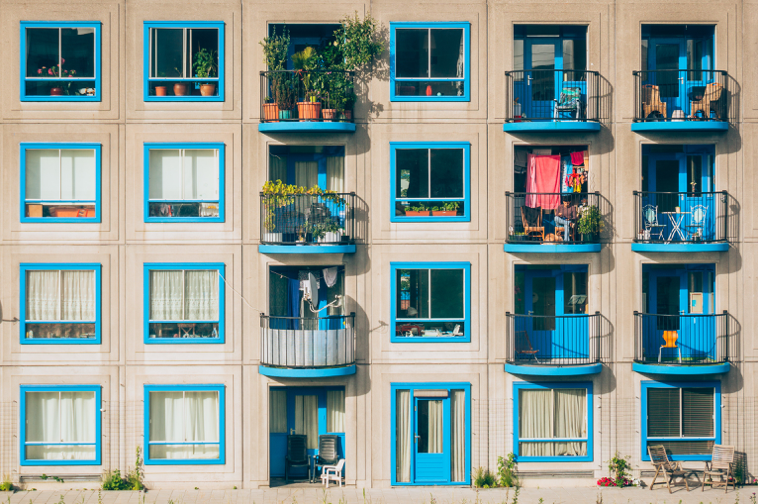 Co-living communities also typically offer residents — sometimes referred to as “members” of a co-housing community — access to property maintenance, cleaning services, and high-speed Wi-Fi, all frequently included in monthly rental fees. And while roommates may be top of mind when thinking of co-living, in most cases, people never share bedrooms with other housemates. For Crowther, he shared the multi-unit living quarters with four other people who had their own bedrooms and were also looking to save money and meet new friends. “Affordability was a huge bonus,” he says. “My rent included everything (utilities, high-speed internet, etc.) and was only $390 per month.” While that price may seem relatively low compared to larger primary markets like New York City, where the average price of a co-living apartment is $1,500 per month. For entrepreneurs, the lower cost is a major incentive, since an average one-bedroom apartment in Manhattan is $3,700 per month, more than double the rent of a co-living arrangement. In fact, some co-living properties are specifically tailored to start-up business owners and entrepreneurial teams. IvyStart, a New York-based co-living property, is one of them. According to the company’s website, it offers flexible and affordable living for Ivy League graduates-turned-entrepreneurs who have passions for big ideas, technology, and doing what they love with like-minded people. Additionally, flexible leases are a major draw. One month a co-living resident may need to work overseas, and the next month could call for a stint in Silicon Valley. The unpredictable schedules that come with entrepreneurship and freelancing are a factor that co-living communities often accommodate. For instance, IvyStart offers open-ended leases for as short as one month but that can go for as long as residents need. Co-living can be the answer to old age isolation. The option of renting indefinitely is ideal for the aging population, who could benefit from all the perks that co-living arrangements bring. From the sense of community to the shared facilities and amenities, co-living could offer social activations for this demographic that retirement and nursing homes don’t typically provide. Today, more senior citizens are downsizing from their spacious homes and want to enjoy the advantages that urban living affords. At the same time, communal living arrangements like these help senior citizens steer clear of the loneliness and isolation many face as they age. Co-living could be the answer. Plus, research shows that close personal relationships and friendships are a key factor to living longer. While the concept of co-living may seem novel and innovative, it’s actually not. Historically, it goes back centuries. Only relatively recently has the idea of single, two-parent homes been the mainstream way of living, specifically in the U.S. Traditionally, living in communal spaces has always been the go-to for humans. Even though the possibility of losing different levels of privacy may deter some people from exploring co-living residences, that’s one of only a few downsides. The benefits seem to outweigh the disadvantages for those looking for affordable, communal housing with adjustable leases. As the co-living sector continues to adapt, real estate developers will find ways to meet demand. “We’re keeping a close eye on this trend because it seems to represent a beneficial opportunity for investors and developers,” says Rice.